Our range of products include modular belt conveyors and fruits belt conveyors. 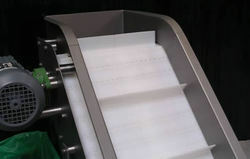 We are engaged in offering a quality approved range of Modular Belt Conveyors to our clients. Being a leading enterprise of this industry, we are offering a huge range of Fruits Belt Conveyors to our clients. Looking for Belt Conveyors ?